Take Highway 401 eastbound to exit #410 (Brock St. S). Drive all the way down south and continue eastbound on Water St. The park is located beside the lake. A shelter has been reserved at the farther end of the park. Please make your reservation for this most memorable event. We will pay tribute to our alumni who graduated 40 and 50 years ago, the latter of which is also the first group of Form Five graduates since our school started. A photo booth will be set up at 6:00 p.m. to capture your memorable images. Please come to join the celebration as your presence will definitely make the event most meaningful. Do not hesitate to let us know if you require assistance in transportation. I am the one to initiate this scholarship through the help of the BHJS Alumni Association of HK/ Ms. Agnes Lin. My purpose is to raise the interest of those who have strong interest and performance in Chinese Literature from the Class of Form 2 and Form 3. I put up HK$10000 as the initial fund and hope to have more donations from Alumni in overseas especially in North America no matter you just donate $10, $20. I know that you will have annual dinner on March 30 that please spread this news to everyone especially those who were taught by Mr.Sen years ago like me. In response to the above appeal, the Executive Committee of BHJS Canada Alumni has agreed to contribute Can$300.00 from our accumulated reserve as a support to this scholarship. Extra funding will be raised in the AGM. 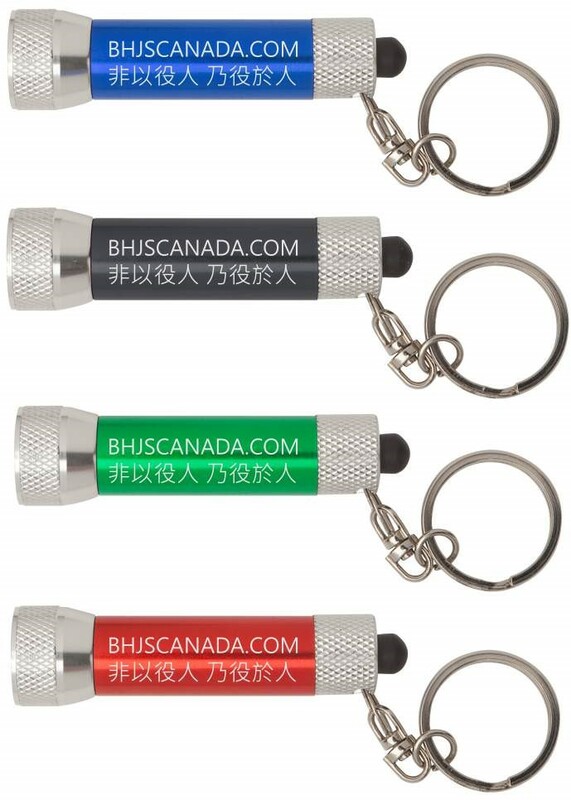 The LED mini flashlights shown in the following picture inscribed with our school motto will be given to person with a minimum contribution of Can$10.00. All alumni are welcome to make personal contribution by contacting directly with Ms. Agnes Lin, current president of Bishop Hall Jubilee School Alumni in Hong Kong. A period of fifty years is inevitably lengthy for those alumni who have walked through their lives since graduation in 1964. Even for those who are following their various foot-steps ten years later are now advancing to the senior ages. Time flies and waits for no one. With vivid memories of those old school days often lingering around us, why not take this special opportunity to walk through those memory lanes together? The sharing of joys (or even hard times) and experiences is more important than anything else in one’s life. It not just helps the younger individual to head a better and more meaningful life, but also fulfilling the expectation of the late Bishop Rowen Hall and the first principal Mrs. Helen Wong our school motto Non Nascor Mihi Solum 非 以 役 人 乃 役 於 人 . Please reserve the following date for this special occasion. A photo booth will be set up to freeze every happy moment. See also instruction for on-line registration.